Warwick Castle is one of the most famous and daunting castles in the World. Warwick Castle has a chequered history which moves from its construction as a Wooden Motte and Bailey castle by William the Conqueror to a massive stone fortress. Surviving siege warfare to the Age of Medieval Knights and Chivalry and the English Civil War. The name Warwick means 'dwellings by the weir' - a weir was a fence or wattle built across a stream to catch or retain fish. The Warwick wooden Motte and Bailey Castle was defended by the River Avon on the South side and by wide and deep ditches on all other sides. An important feature of Warwick Castle is its access to the River Avon. During the construction of Warwick Castle men, equipment and building materials were easily transported by boats to the site of the castle. Once Warwick Castle had been built built fresh supplies, provisions and reinforcements prevented the castle occupants from being starved into submission during siege warfare. William the Conqueror used enforced Anglo-Saxon labour for work on the construction of Warwick Castle. The wooden castle was replaced by a fortified stone castle in 1260. The two main round towers were built at the front of the castle and the Chapel and large hall were built against the south wall. Various additions were made to Warwick Castle as time passed - Guys Tower and Caesar's Tower were added at the end of the fourteenth Century. When was this Medieval Castle built? 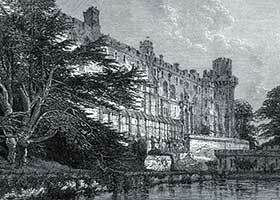 The Earls and owners of Warwick Castle passed through several great dynasties. The medieval earldom was inheritable through both the male and the female line of descent, and thus was held by members of several families - the Beaumonts and Beauchamps, the Nevilles, the Dudleys, the Richs and the Grevilles. The history of the construction of Warwick Castle is fascinating. The construction of the castle was ordered by William the Conqueror and quickly constructed as a wooden Motte and Bailey structure. The wooden castle was replaced by a fortified stone castle in 1260. The two main round towers were built at the front of the castle and the Chapel and large hall were built against the south wall. Various additions were made to Warwick Castle as time passed - Guys Tower and Caesar's Tower were added at the end of the fourteenth Century - these were built on the style of the French Donjon or Great Tower affording more security and luxury to Warwick Castle. Both Guys Tower and Caesar's Tower were constructed to contain several storeys of bright rooms with fireplaces, garderobes and bedrooms. They were both constructed as part of the curtain wall defences, although they are self contained. The History of the site of Warwick Castle dates back to antiquity and the main events and stories of the Roman, Celts, Saxons, Vikings provide a fascinating insight into its location. The bloody history of Warwick Castle is steeped in treachery, murder, mystery and intrigue. Famous historical figures and events feature in the history of Warwick Castle including William the Conqueror, the Wars of the Roses, John Dudley, Lady Jane Grey, the Civil War and the Age of Chivalry with Knights and tournaments. The History of Warwick Castle events also features a number of sieges when the castle was bombarded with missiles from massive siege engines such as the Mangonel and the mighty Trebuchet. The History and Facts, Events and Timeline of Warwick castle are really comprehensive and cover the history of Warwick castle in detail - follow the links at the top of the page and live the history of Warwick Castle.